I believe that half of the knitting world has knitted a Clapotis by now. Well, now I can join them, too. I started this scarf at the end of August. I thought the pattern would make a great knitting for lectures. And so it did: it rather simple to follow, yet a bit more interesting than regular scarves due to all increases and decreases. And I love the rows of dropped stitches! 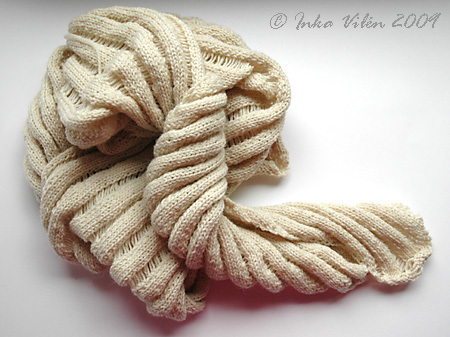 My Clapotis was made of Novita Luxus Alpaca. Thought that four skeins, each 50 grams, would be sufficient, but my estimates on when to start the decrease part at the end of the pattern went a bit wrong and I needed just a bit more yarn to complete it. So now I have an almost full skein of Alpaca. Needle size suggested for this yarn was 3,5 mm, but I used 4,5 mm needles. The yarn is thinner than the one used in the pattern. I decided on leaving the scarf unblocked. 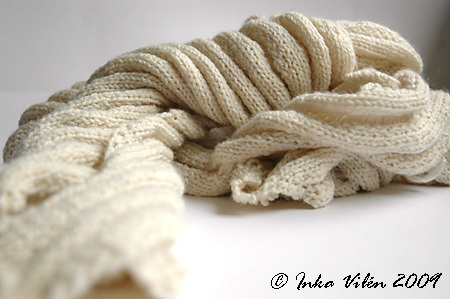 The finished size of the scarf is about 30 cm wide and from the increased tip to the decreased tip about 200 cm. 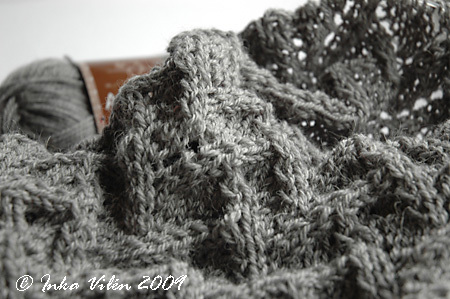 I loved knitting Novita Luxus Alpaca. 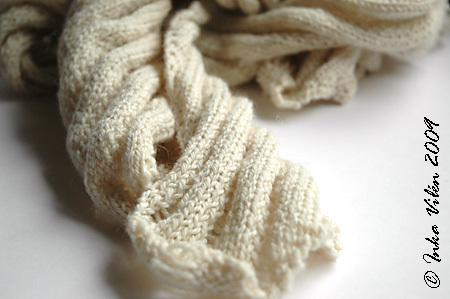 It was so soft and lovely to knit. The only downside to this yarn was the lack of variety in colours: there are only three colours to choose from (off-white, grey and brown). Well, I have already bought some grey Alpaca, and that is turning into a shawl, too. I’ve updated my Ravelry stash and projects today. It’s much more fun to look at the project page now that each project has a photo to it. And what comes to stash, it actually helps having the photo there. By one look I can easily skim through my stash and remember the skeins that I’ve forgotten on the bottom of my storage. The names of the yarns and colours are too much of a memory jog. I’m in a process of decreasing the number of UFOs, at least the 95% ready ones. After all, it’s just a few lousy ends of yarn to get rid of. Here’s to hoping I’ll have new FO’s to declare shortly. This entry was posted in finished, yarn work and tagged Clapotis, knitting, Ravelry, scarf by Inka. Bookmark the permalink. Mä kuulun siihen puolikkaaseen joka ei vielä oo neulonu Clapotista. Mulla on kylläkin ollu lanka iihe valmiina jo jotain vuoden ajan. Joten ehkä mä jossain vaiheessa saan sen neulottuakin.